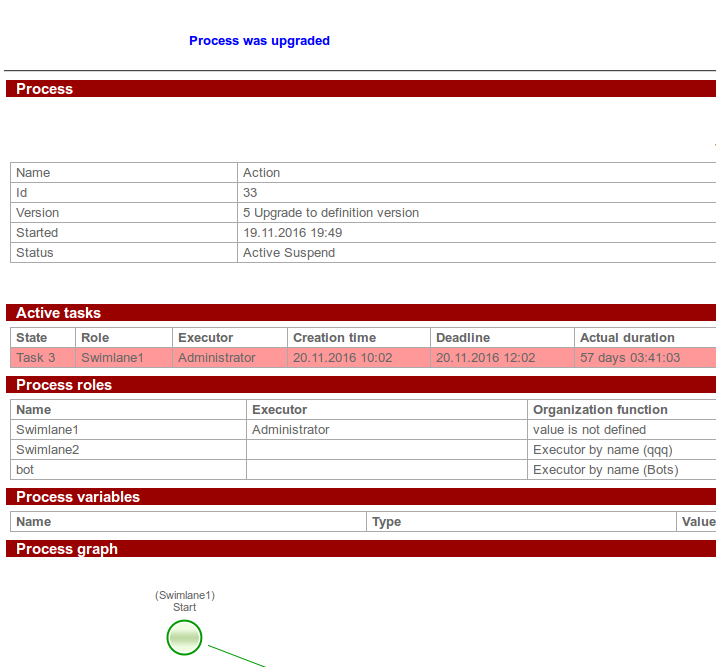 Version upgrade may cause unpredictable errors in case a new process definition differs greatly from the current one.. The parameter responsible for this feature - 'upgrade.process.to.definition.version.enabled is in the system.properties general settings file and since RunaWFE version 4.3.0 is set as true. So, in version 4.3.0 this feature is turned on by default. 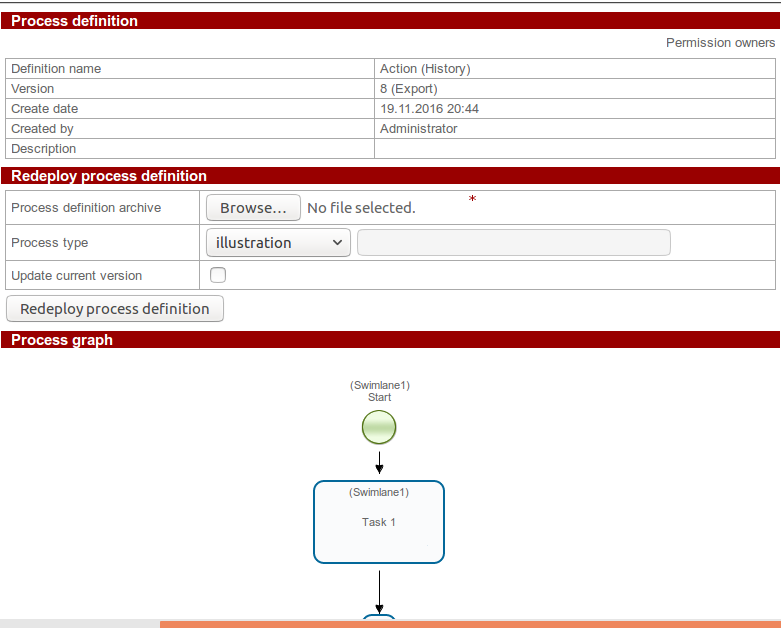 Go to process definition properties, in the “Version” field the current version of the BP example is shown. Next to it there is an “Upgrade to definition version” link for version upgrade. If you click the link, a table with the information on the available BP versions, which you can upgrade the current example to. Select the necessary version and press “Ok”. On the screenshot below you can see that the current version of the BP example is “7”. The administrator chose version “5” to upgrade to. If the upgrade is successful, the user will receive a corresponding message. 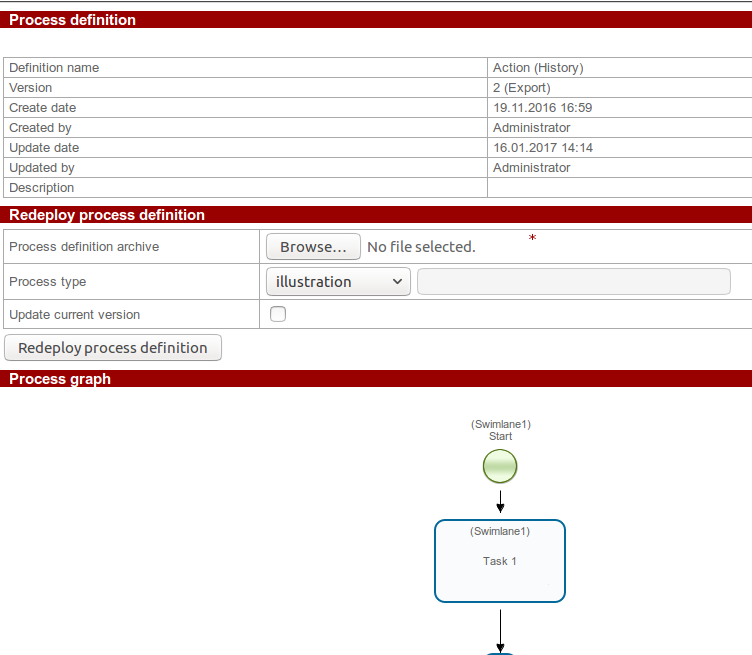 Open “Start process” menu entry, go to BP definition properties. In the “Process definition” section the current version of the definition is shown. In the example above it is “8”. In the “Process name” field there is a “History” link, which allows to open a page with detailed information on uploaded versions of this BP definition. 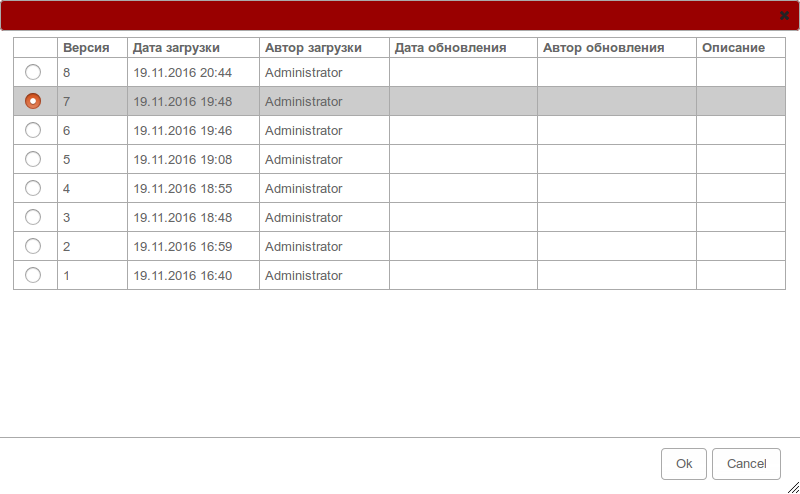 The table has “Name”, “Version”, “Description”, “Process type”, “Create date”, Created by”, “Update date”, “Updated by” and “Processes count” columns. In the “Processes count” column “number of unfinished”/”total number” of BP examples having this version is shown. To go to definition properties of a specific version use the “Properties” link of the corresponding string. Let us consider an example of upgrade of all the “Action” BP examples being executed with version “2” to a new definition version. 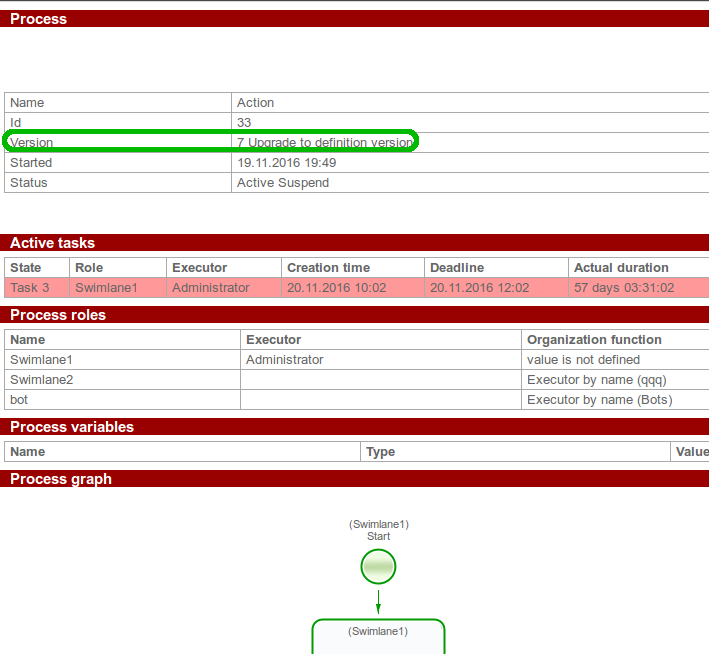 Open BP definition history, go to version “2” properties. 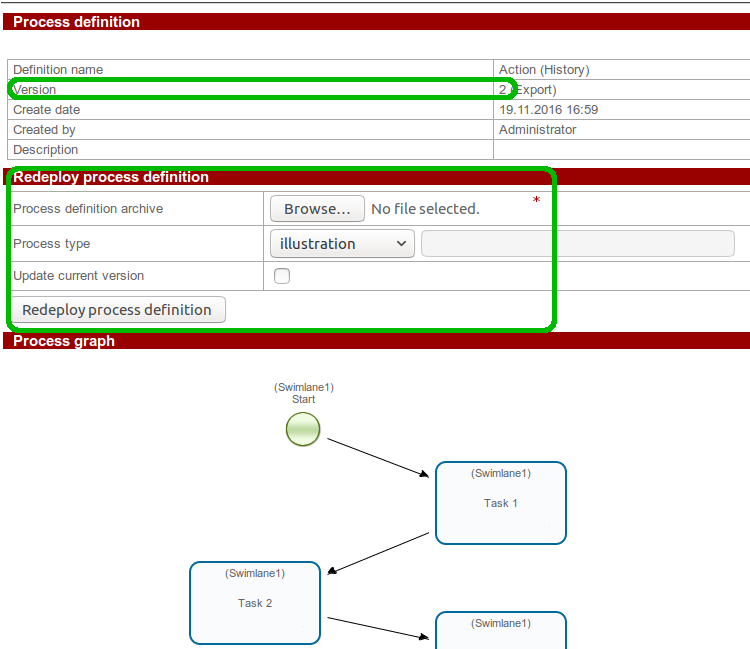 The “Redeploy process definition” section is designed for uploading a new BP version. 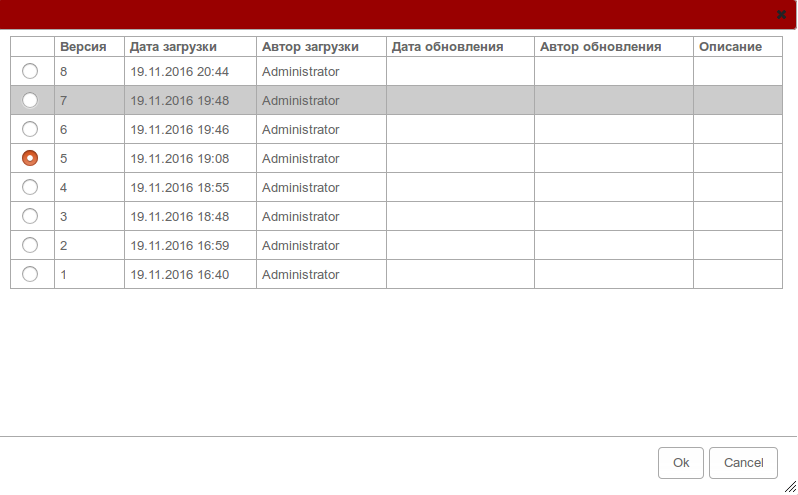 Press “Browse” and select a *.par process file. Enable the “Upgrade current version” option. It will allow you to upgrade the definition of the selected version (in this case version “2”) instead of uploading it as a next new version. The definitions of all the “Action” BP examples with version “2” being executed will be upgraded. This page was last modified on 17 January 2017, at 15:03.